*Tree Planting* – Planning is underway to replace all the trees listed below. When applicable, these trees will be replaced by a similar species in a close proximity. 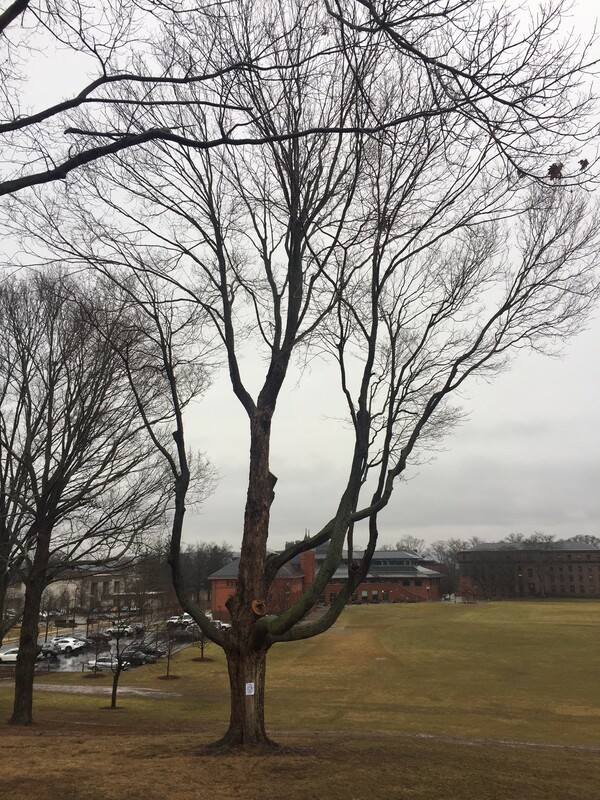 Our hope is that, while we may lose one tree, we can bring it back to life somewhere else. 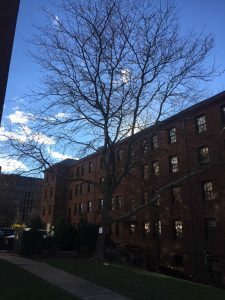 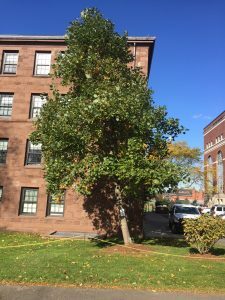 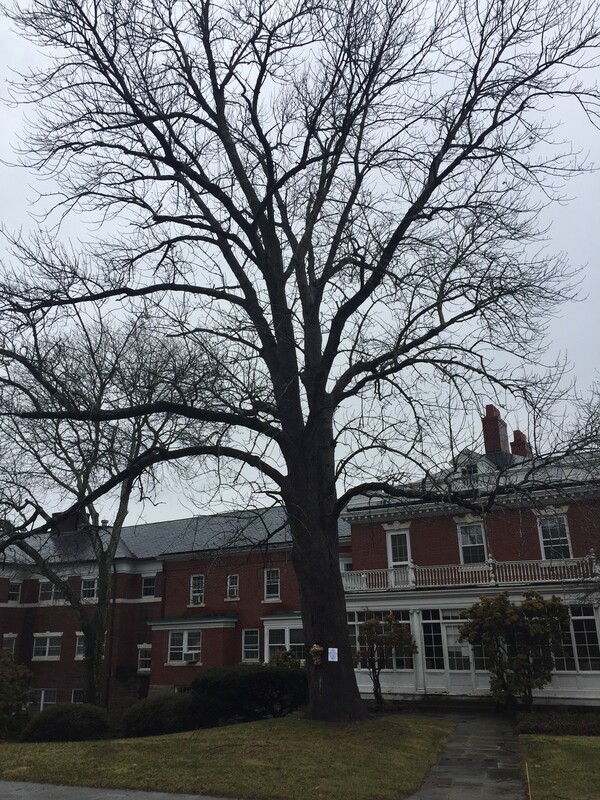 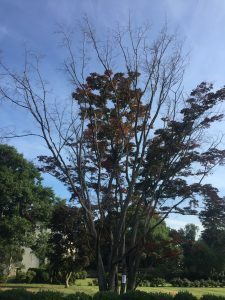 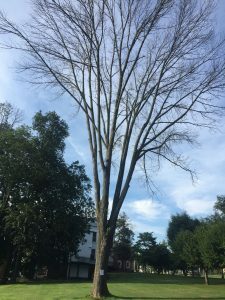 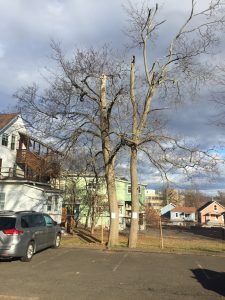 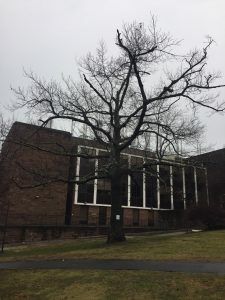 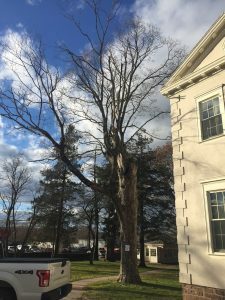 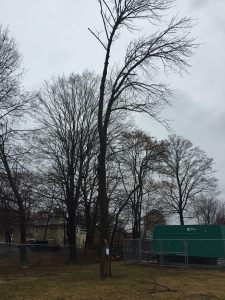 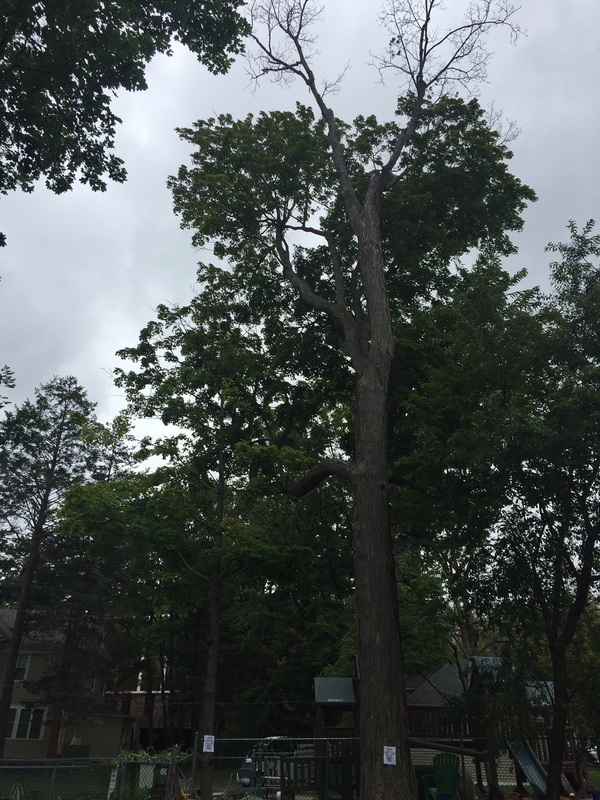 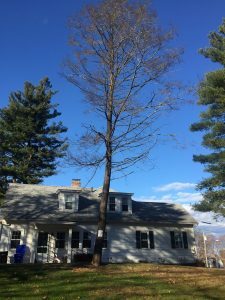 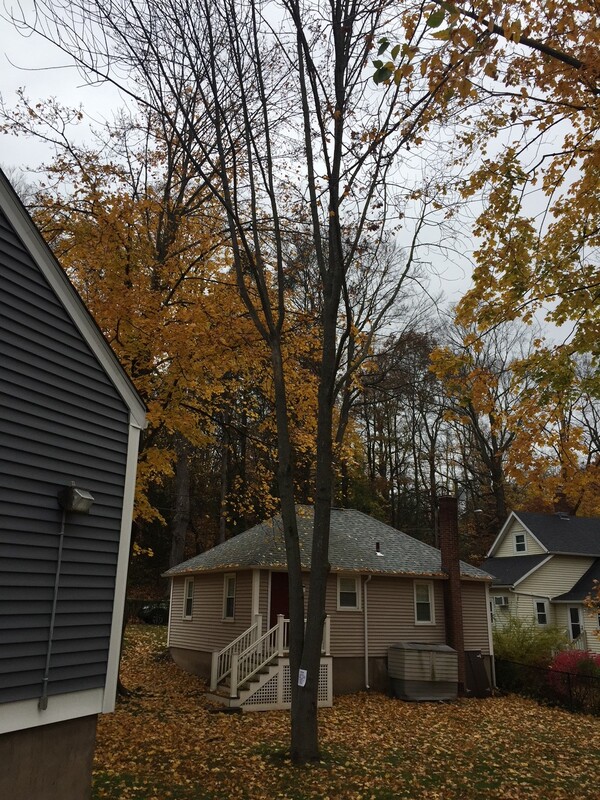 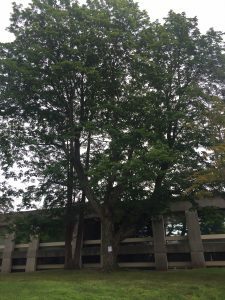 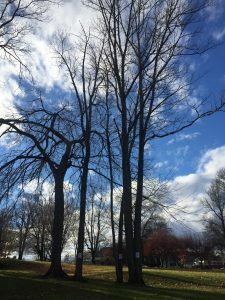 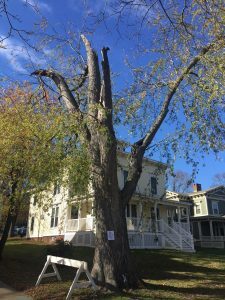 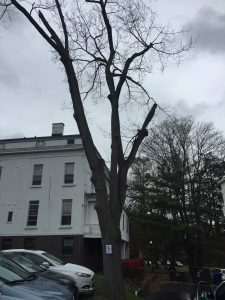 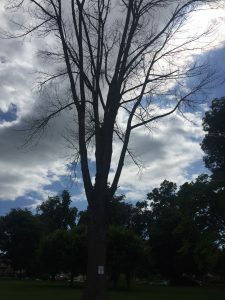 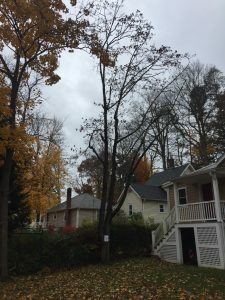 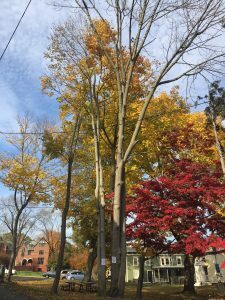 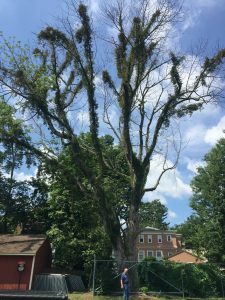 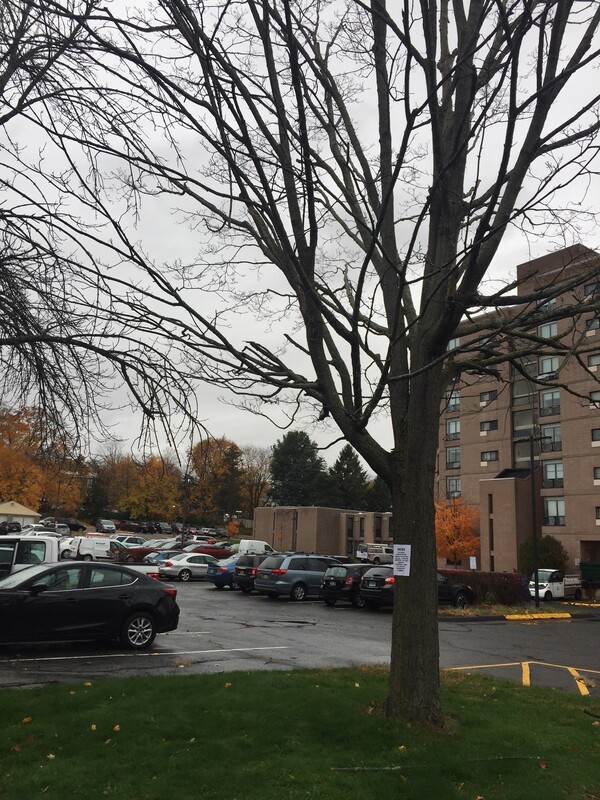 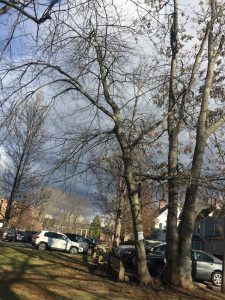 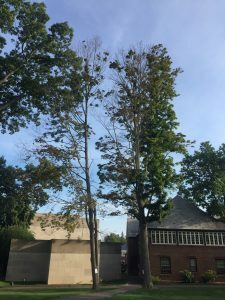 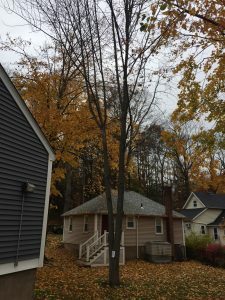 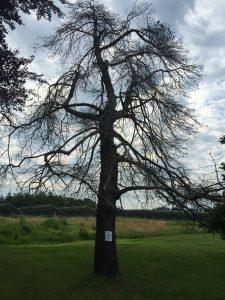 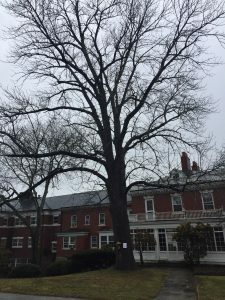 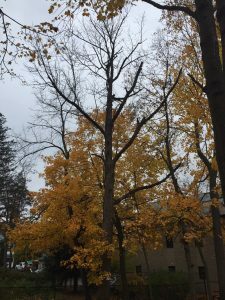 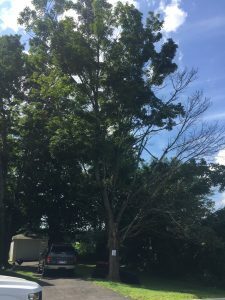 This Sugar Maple has been in decline for some time and needs to be removed. The tree has lost numerous large limbs over the last few years, and is mostly hollow. 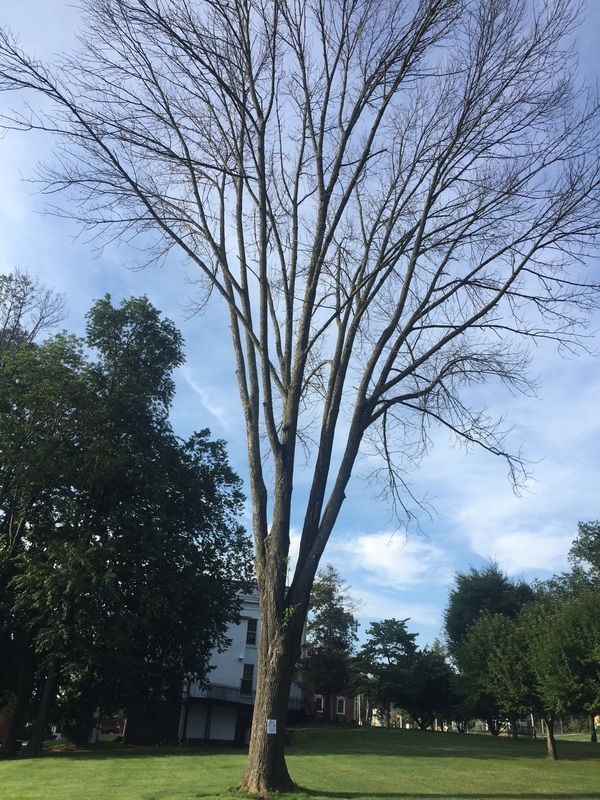 This sugar maple lost a few large limbs in the recent ice storm. 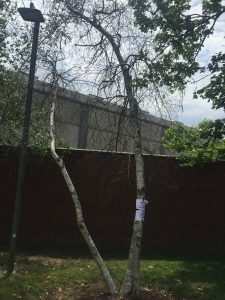 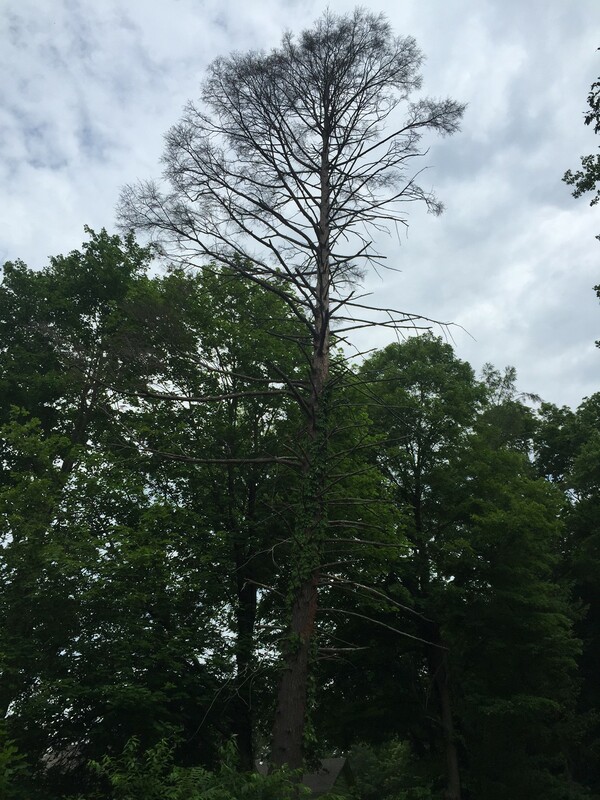 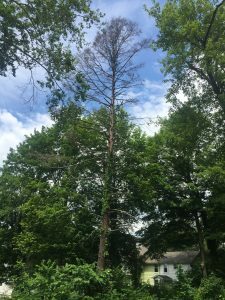 The loss of limbs alerted us to the fact that this tree in mostly dead, and needs to be removed. 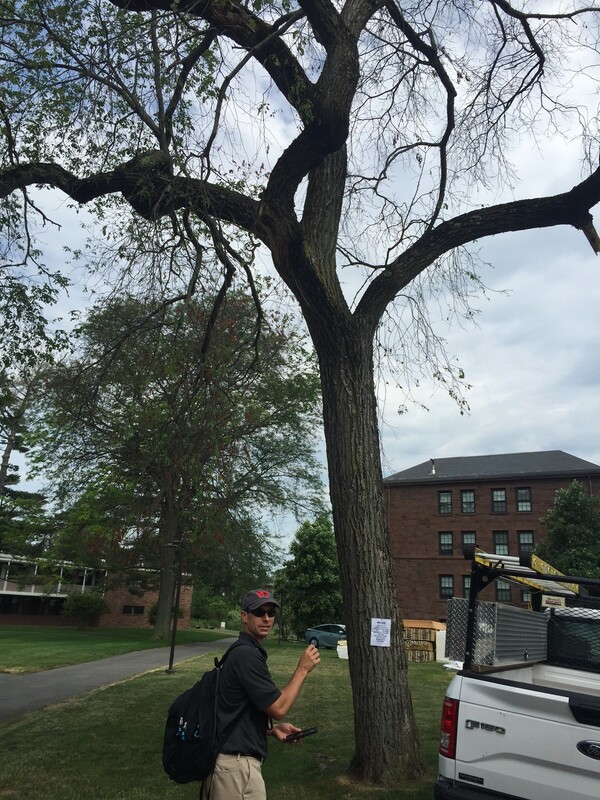 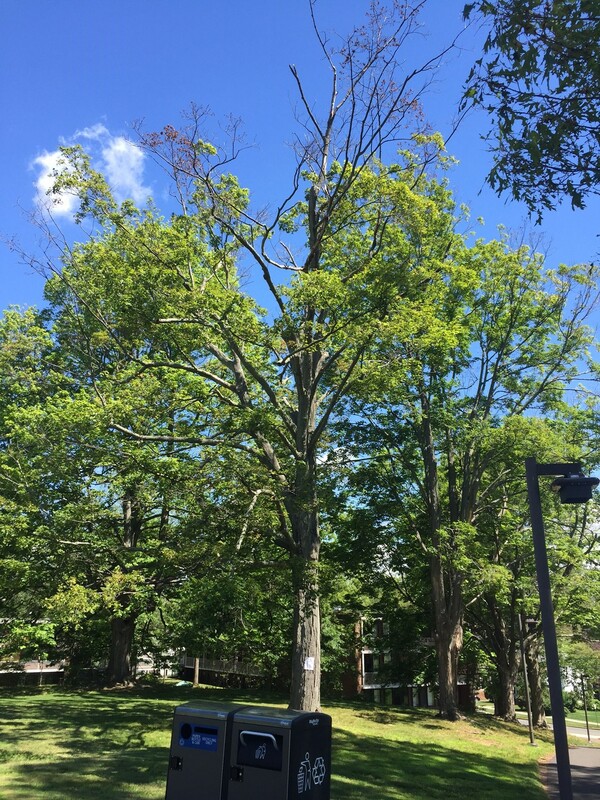 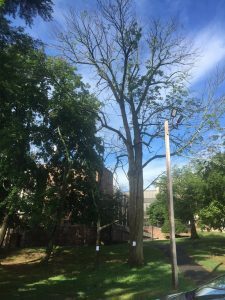 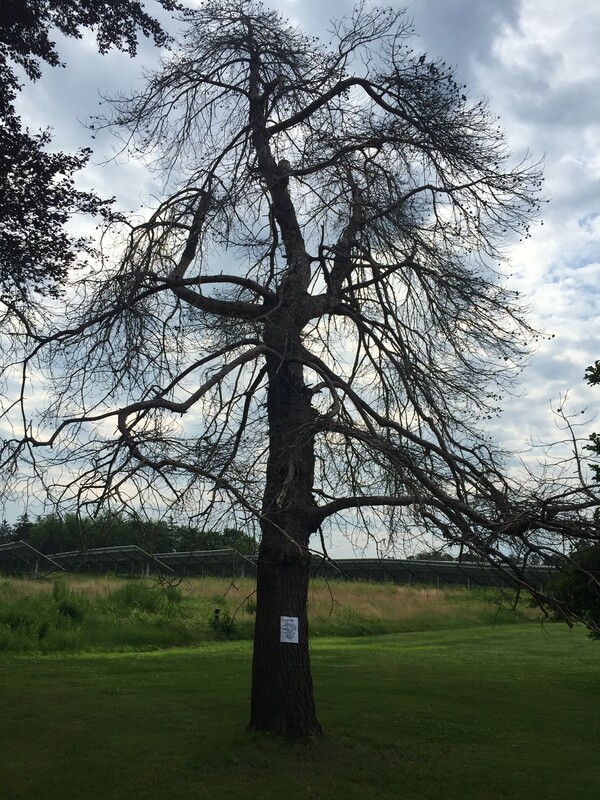 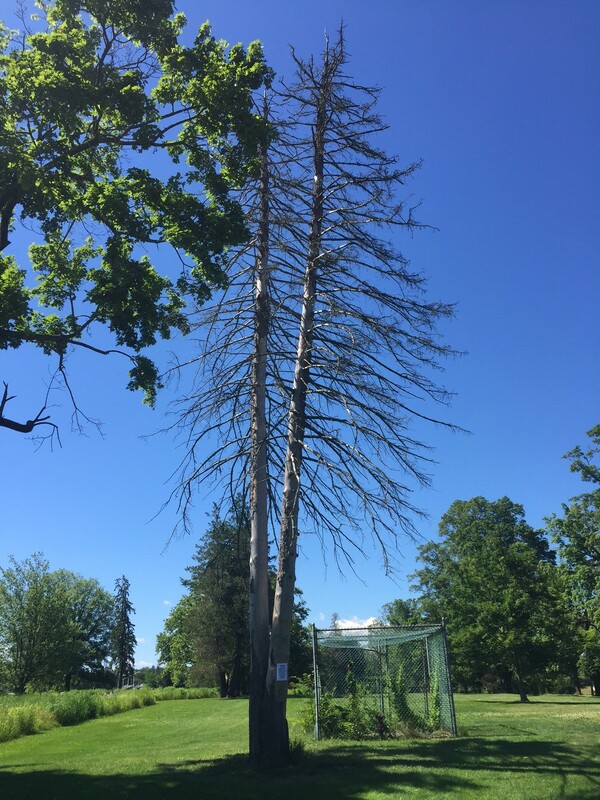 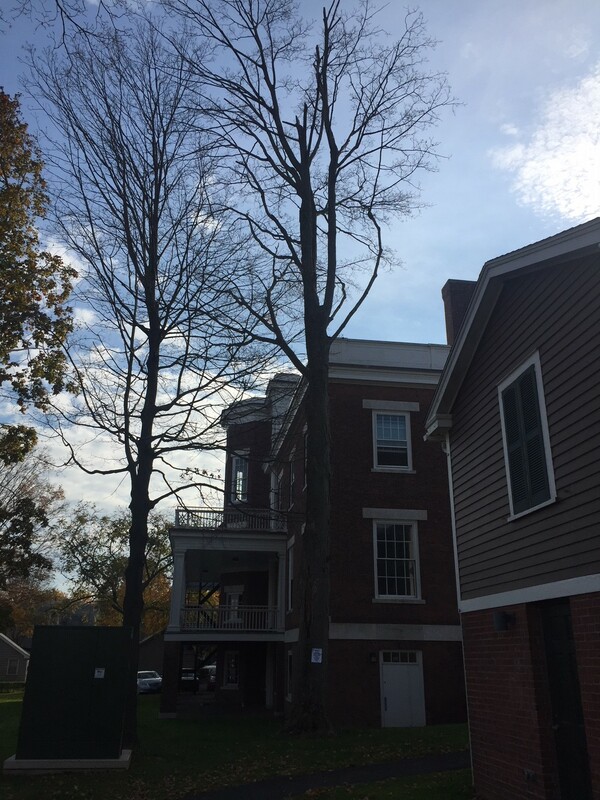 This Ash tree shows an obvious presence of the Emerald Ash Borer (EAB). 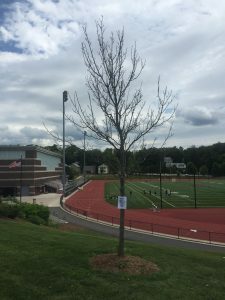 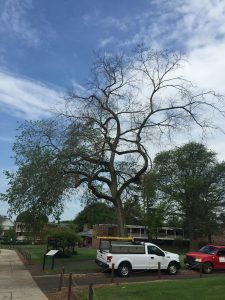 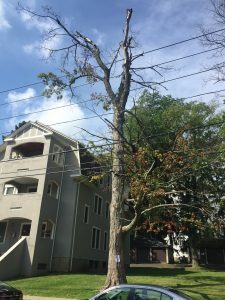 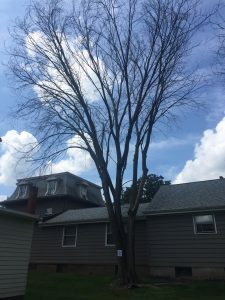 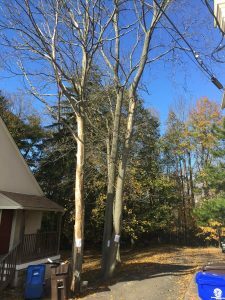 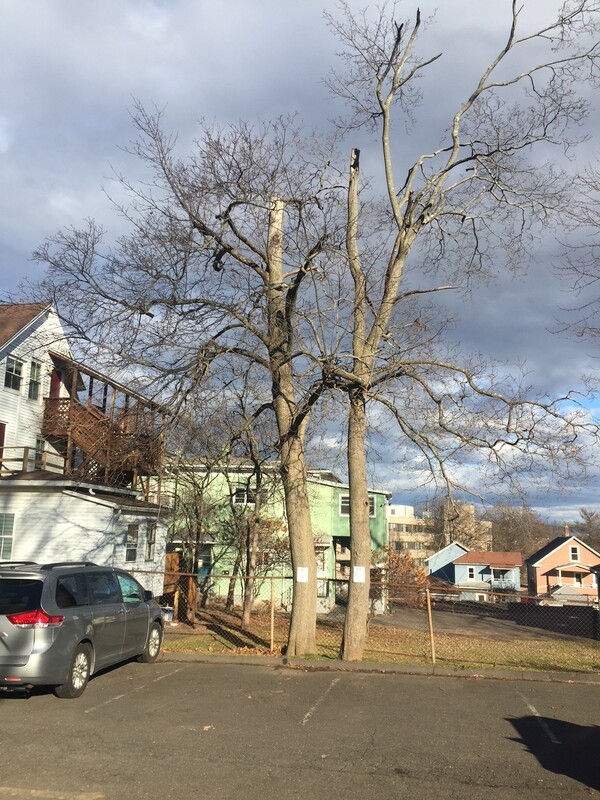 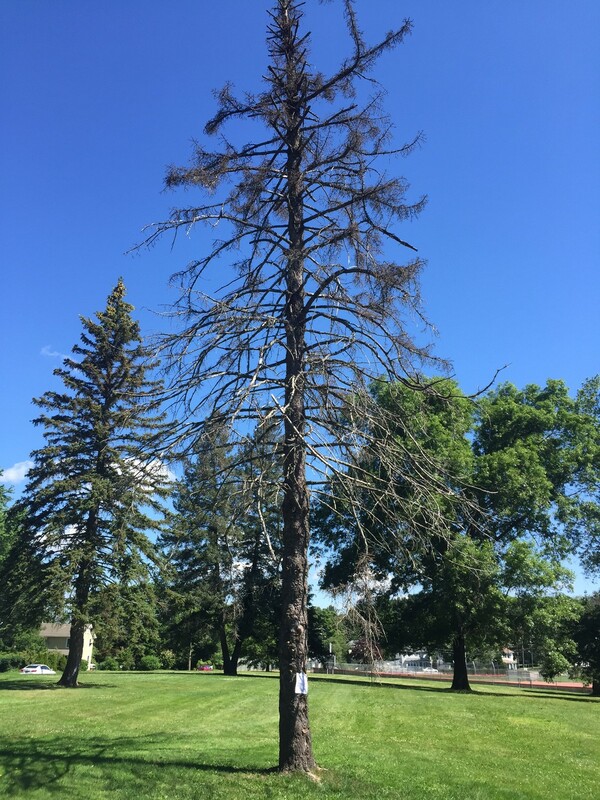 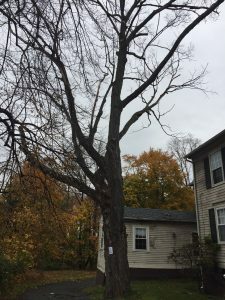 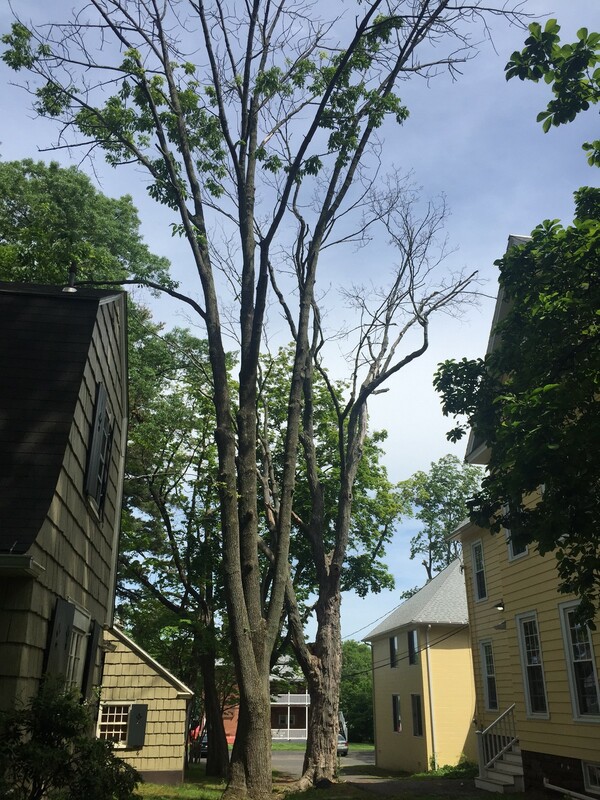 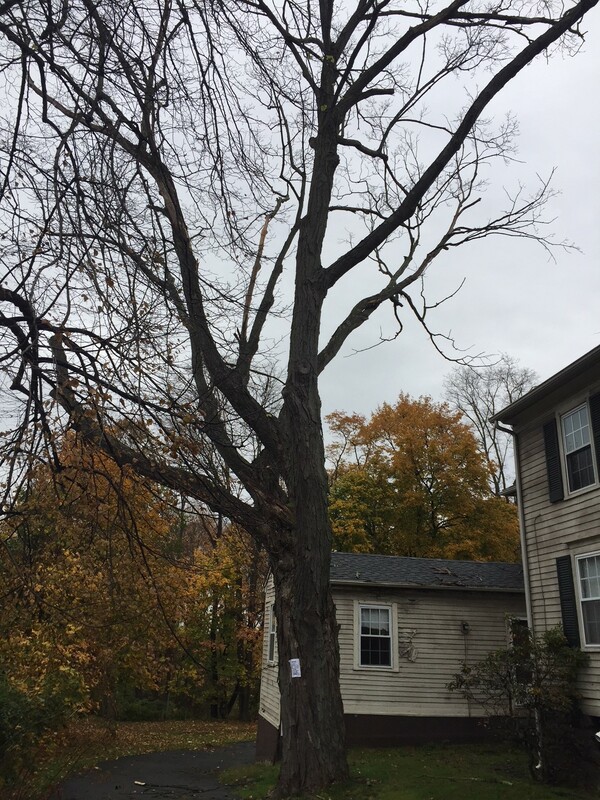 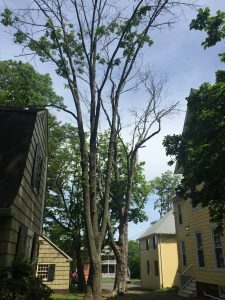 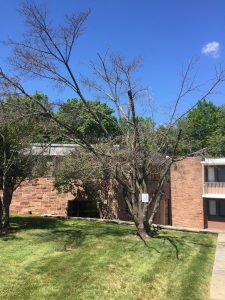 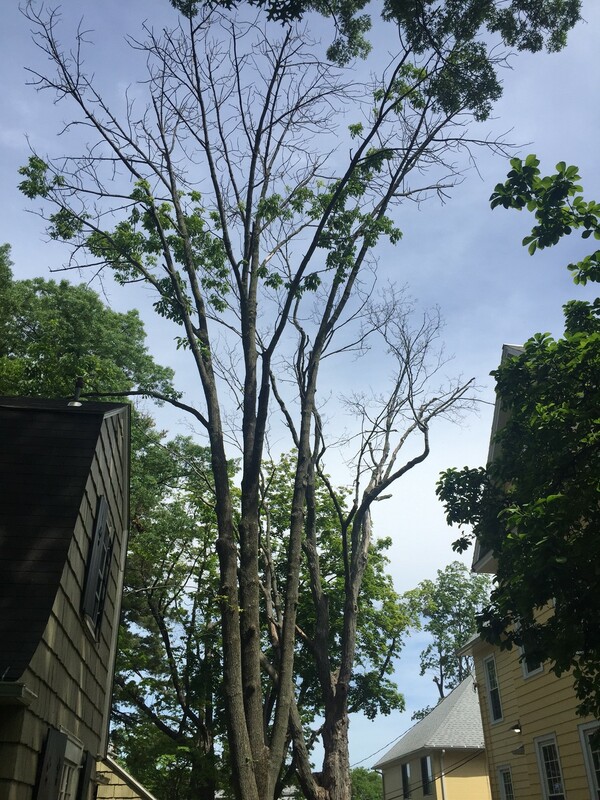 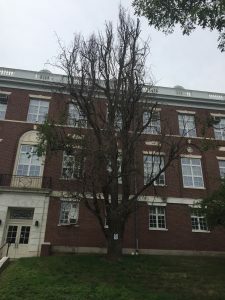 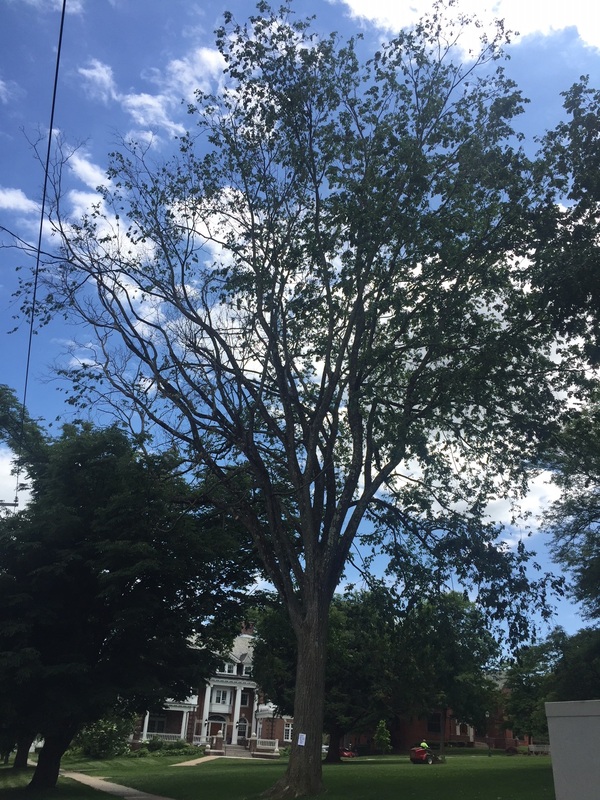 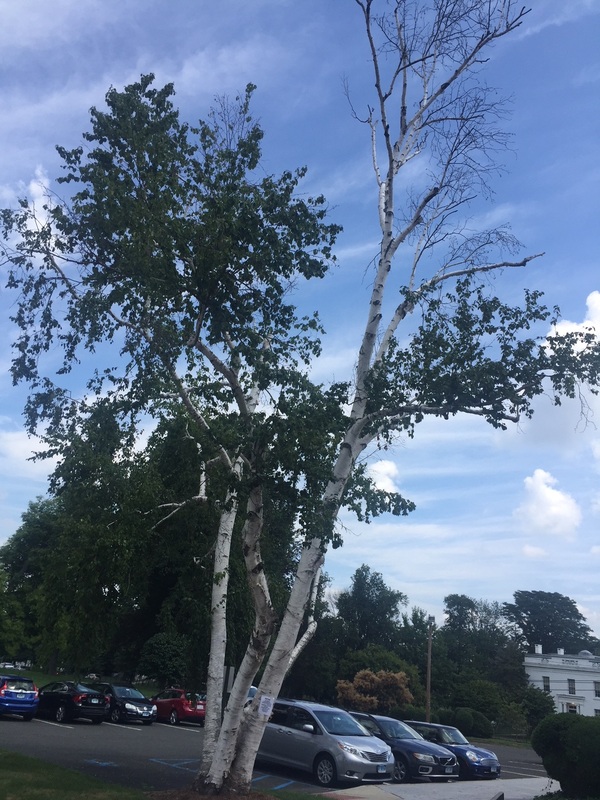 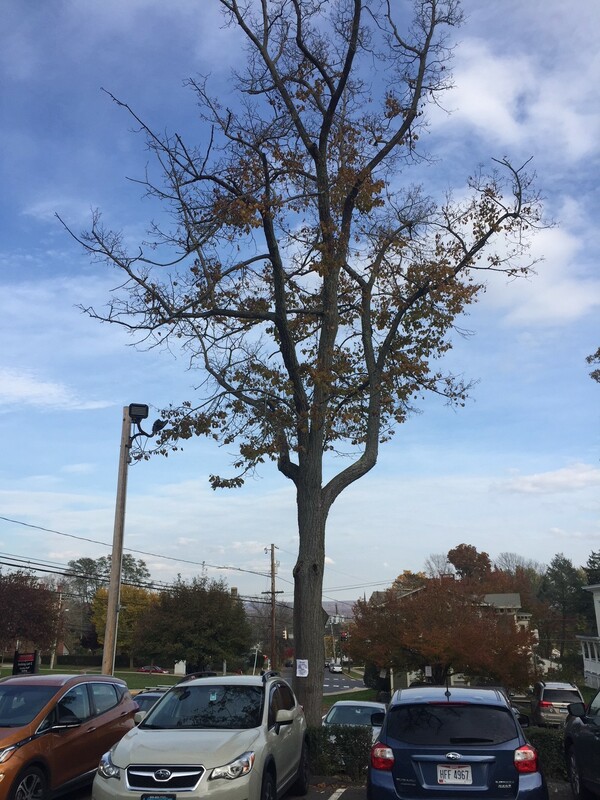 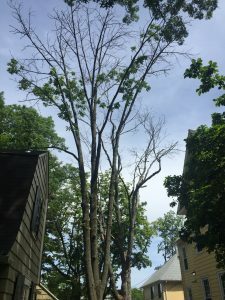 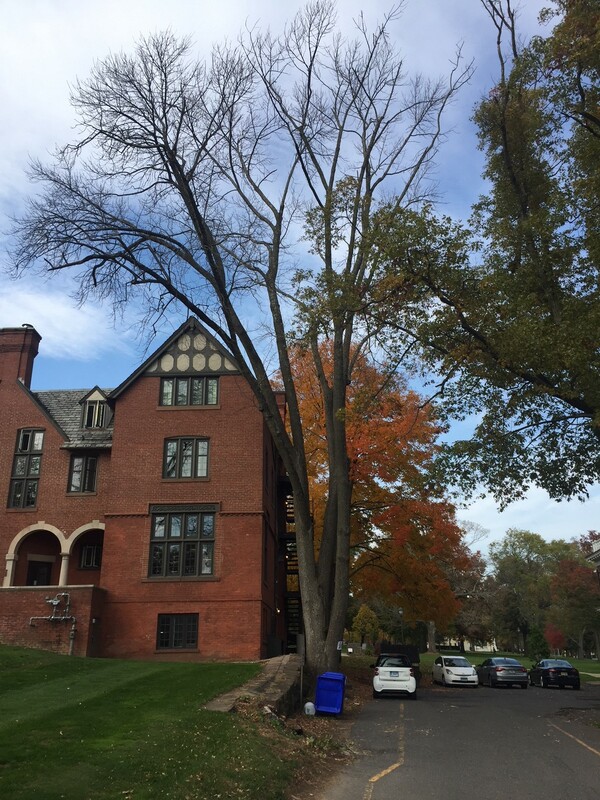 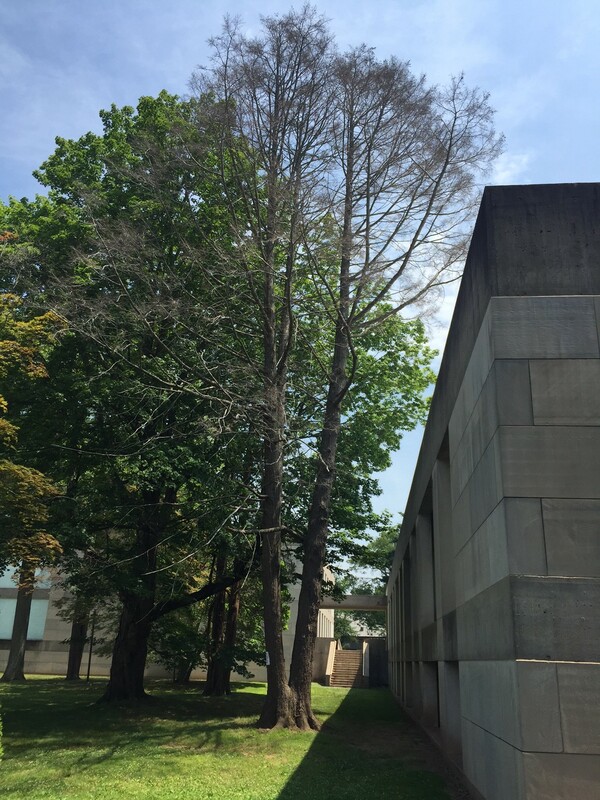 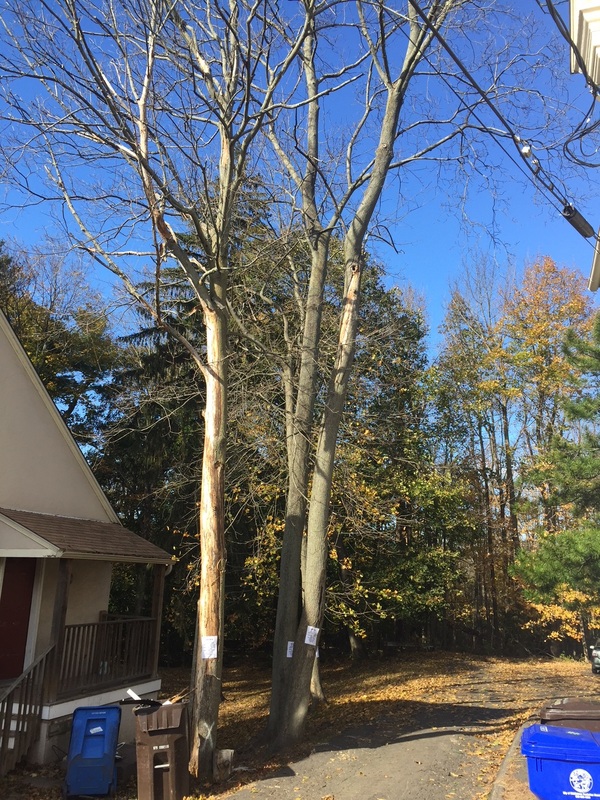 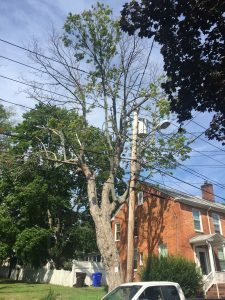 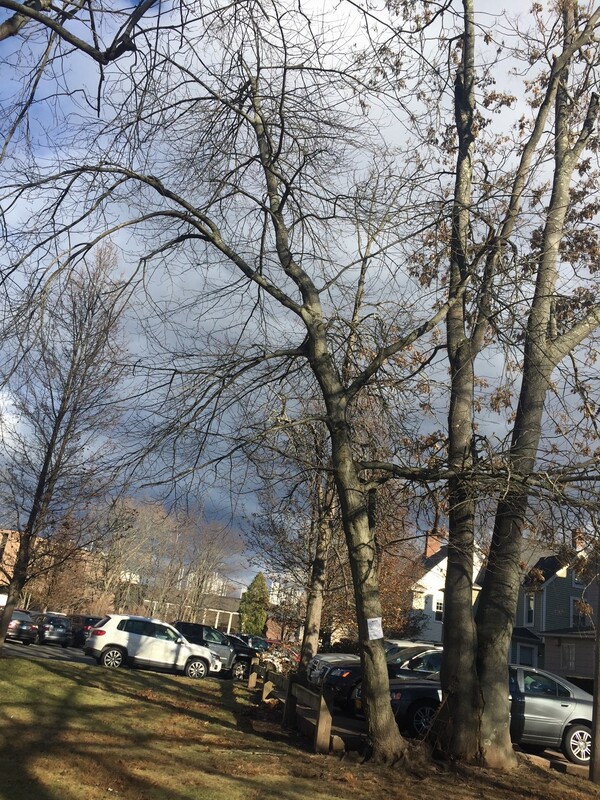 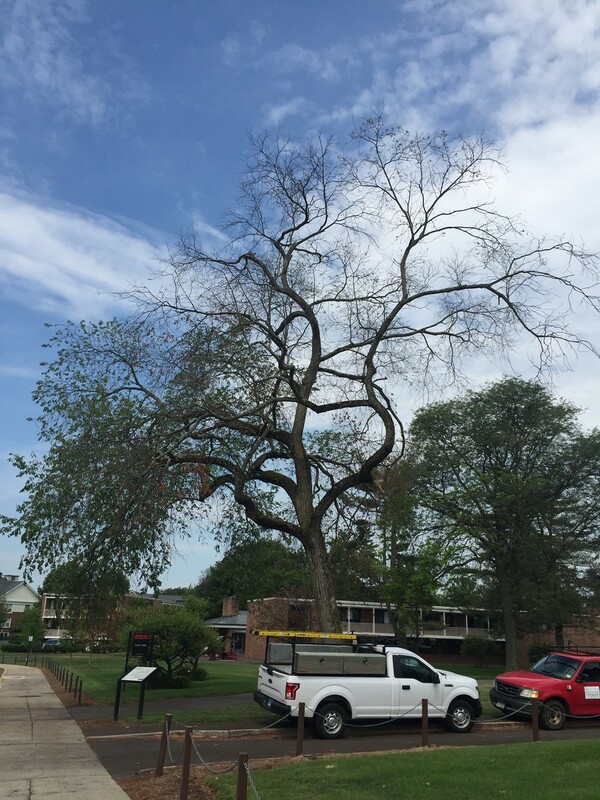 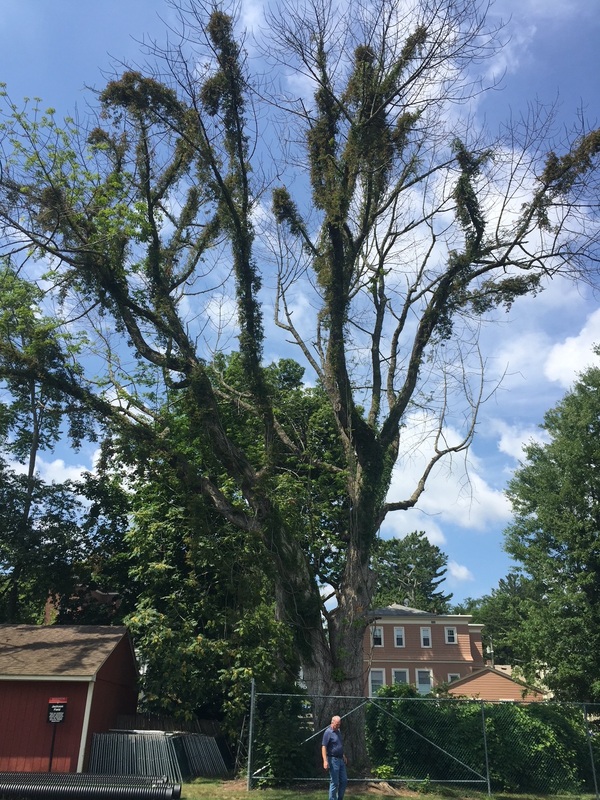 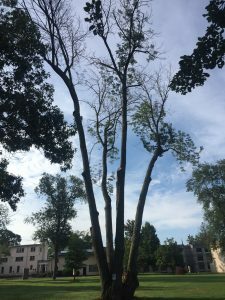 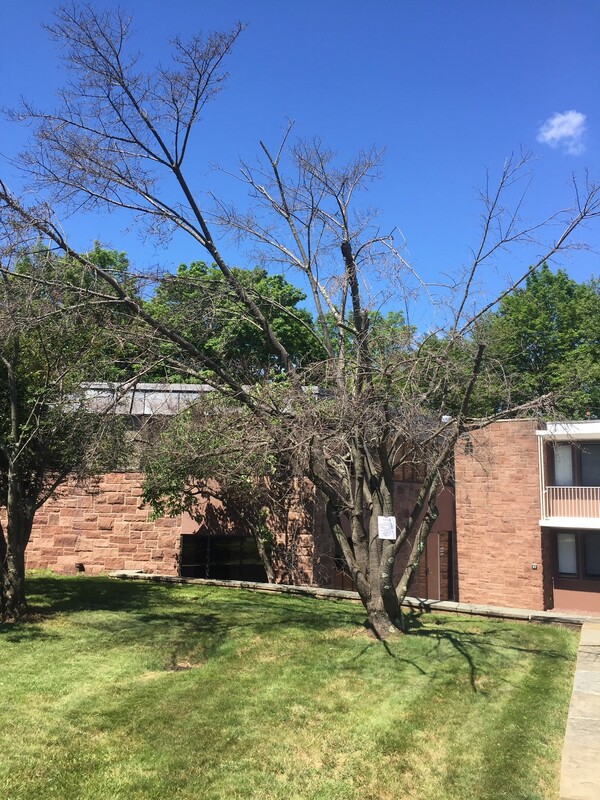 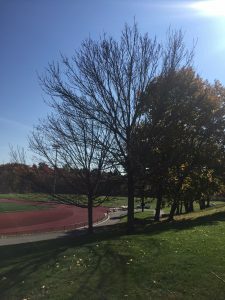 As a result of EAB, the tree is dead and needs to be removed. 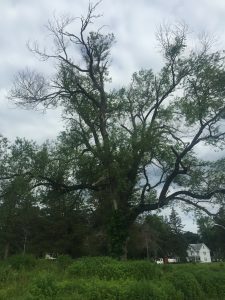 This Oak has been in decline for many years, and needs to be removed. 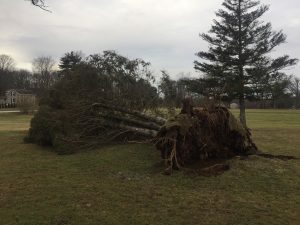 The main leader has broken off, and there is an obvious amount of tip die-back. 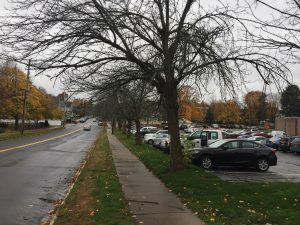 This summer many of the sidewalks to the east of Shanklin and Hall-Atwater need to be replaced. 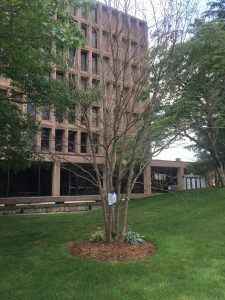 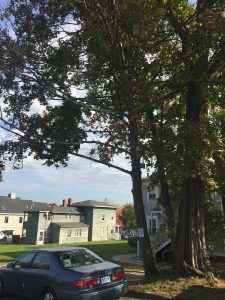 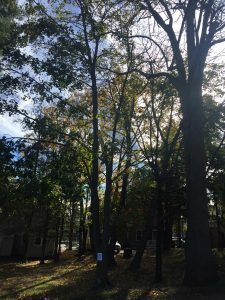 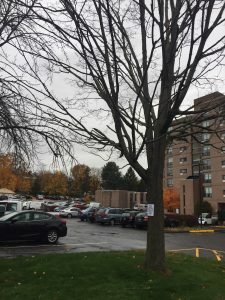 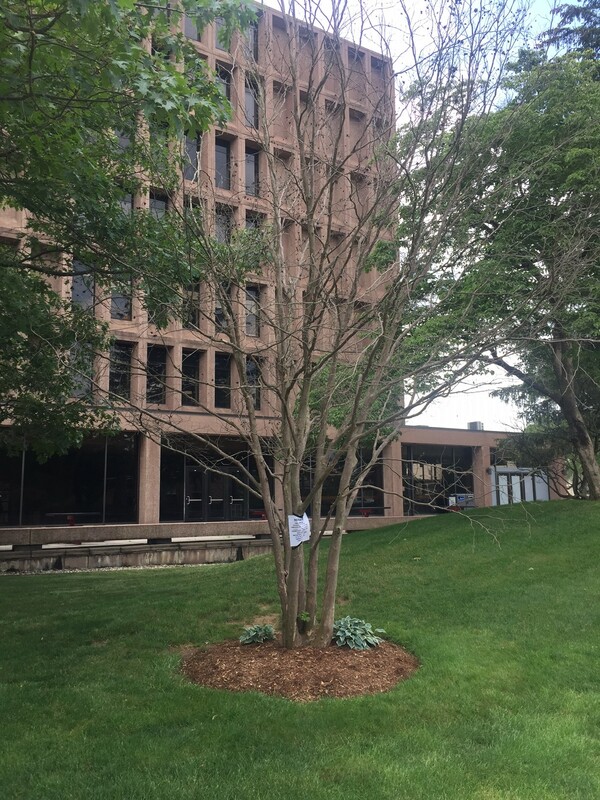 The Norway Maple and Cedar, shown in the picture below, are very close to the sidewalk and will be compromised by the construction. 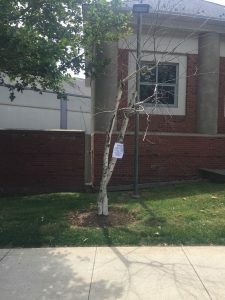 They will need to be removed. 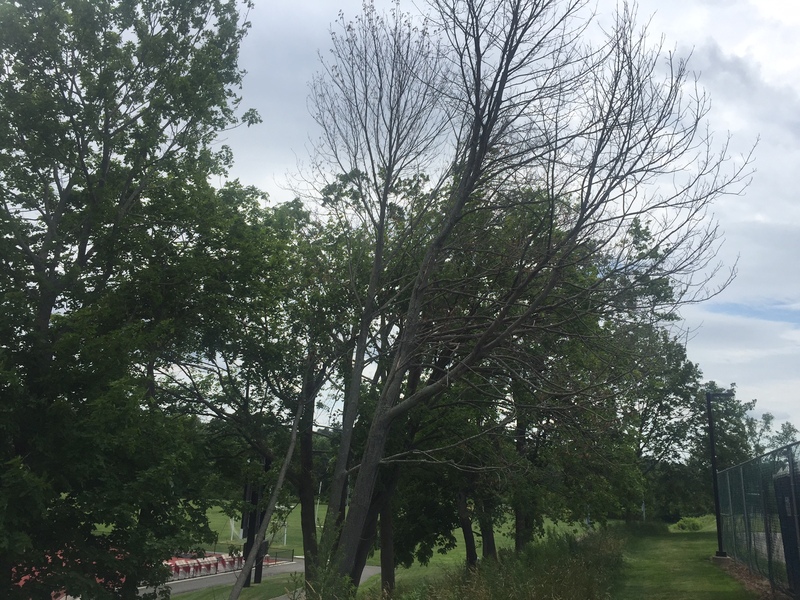 This ash tree is almost completely hollow, and there are obvious signs of rot. 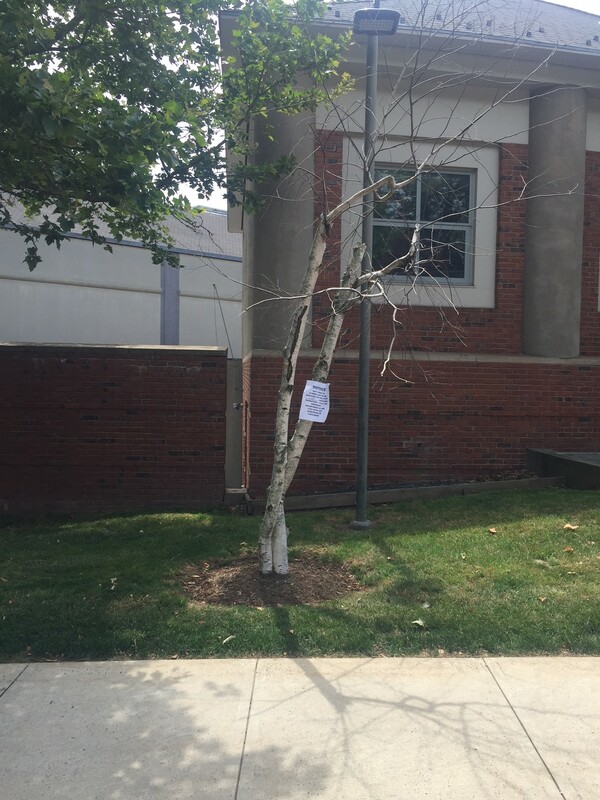 This tree needs to be removed. 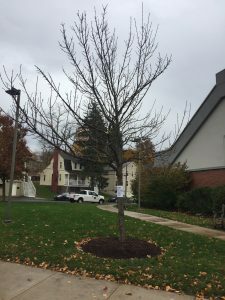 As always, it will be our goal this Fall to replace every tree we remove, with a new planting. 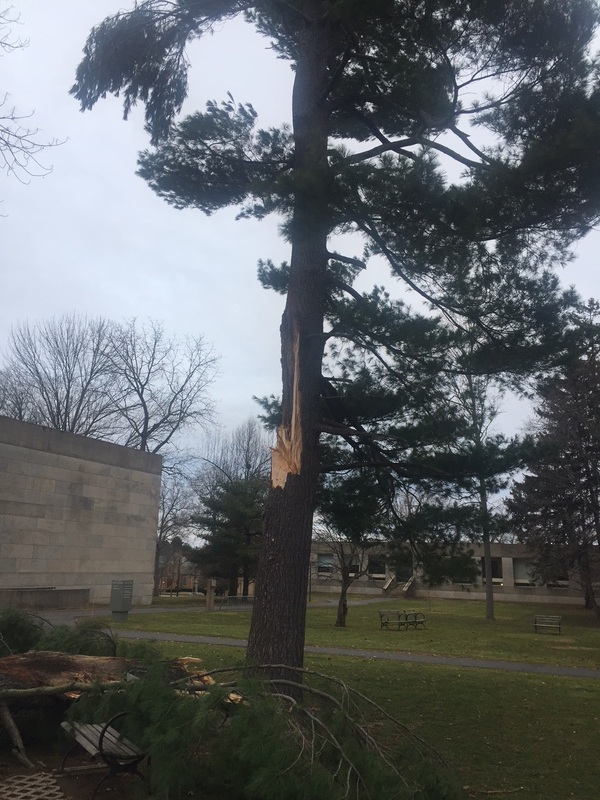 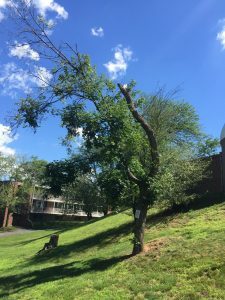 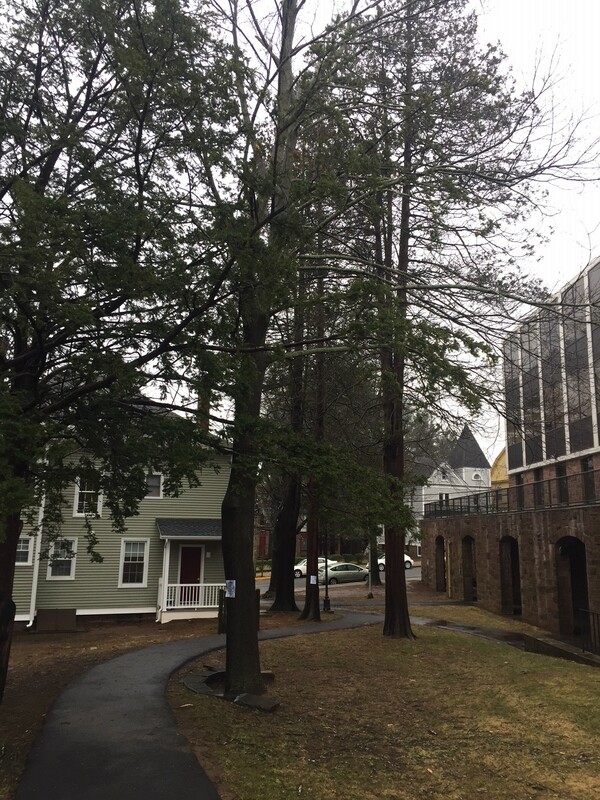 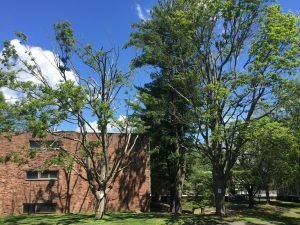 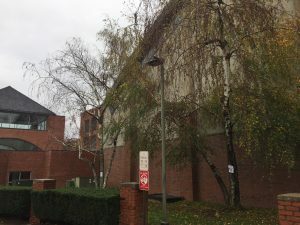 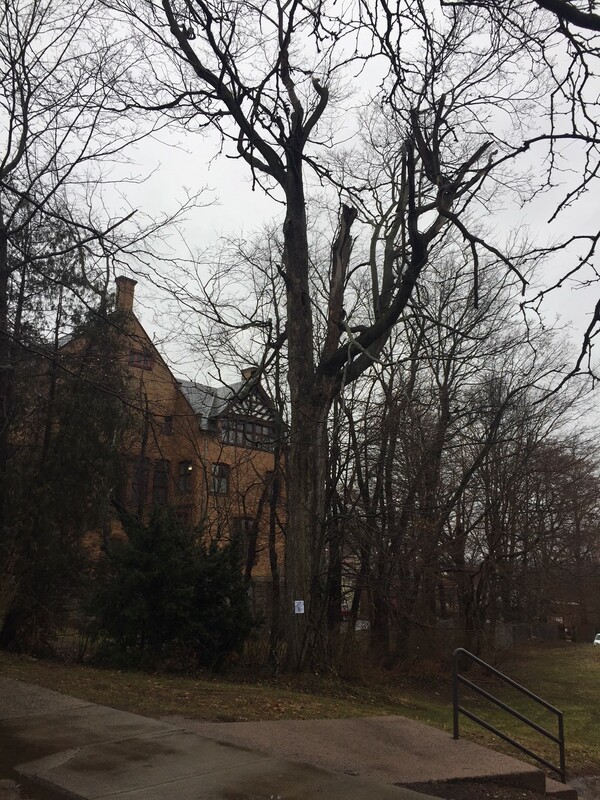 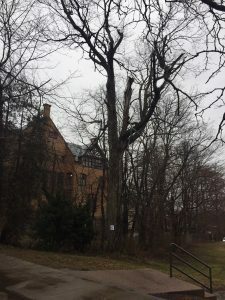 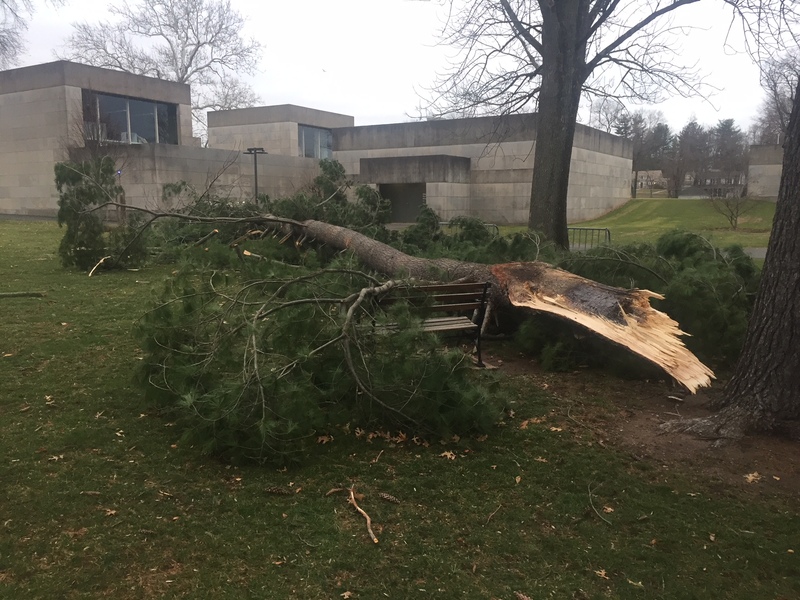 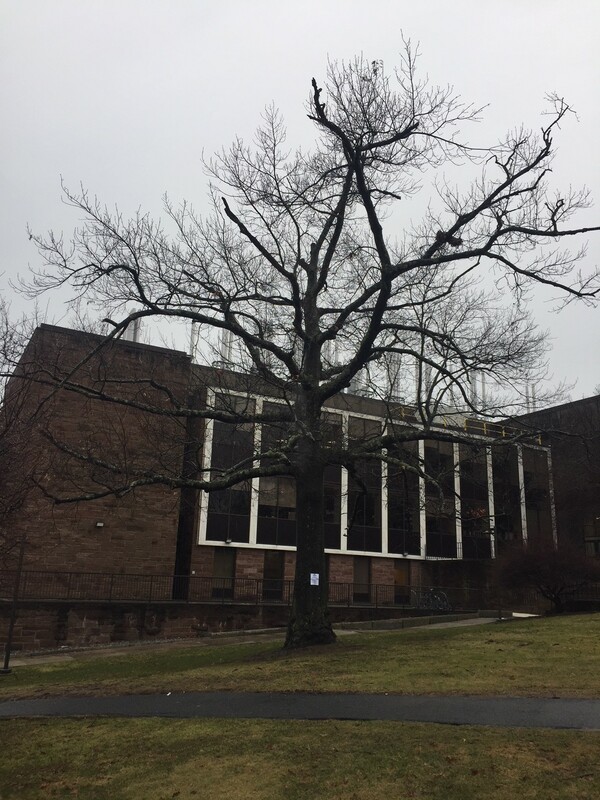 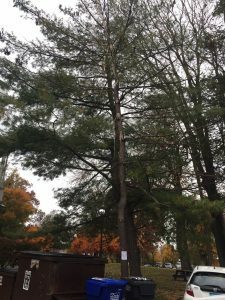 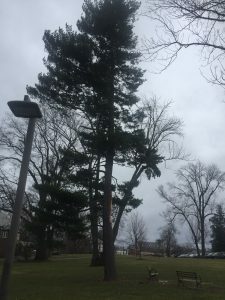 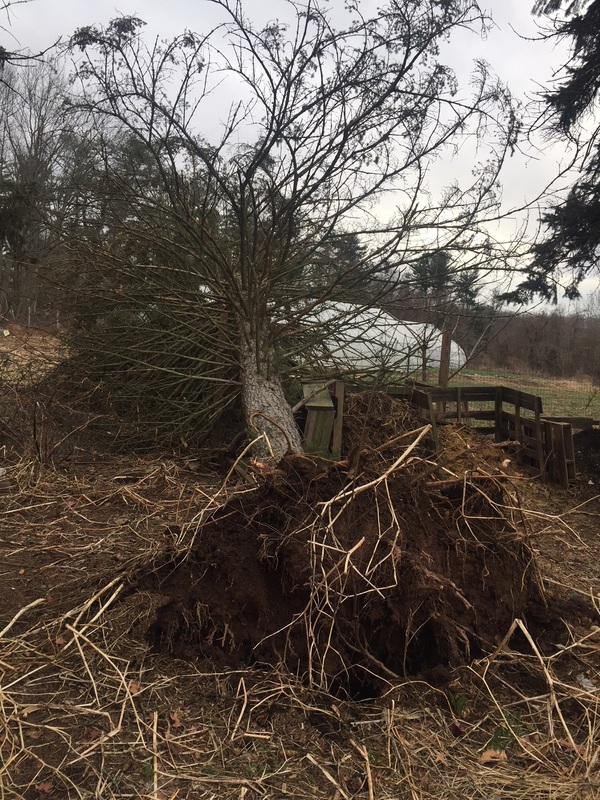 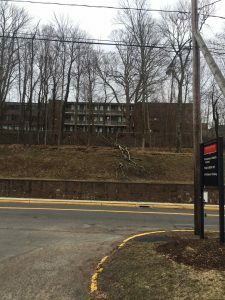 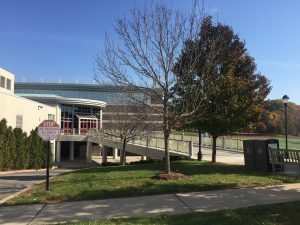 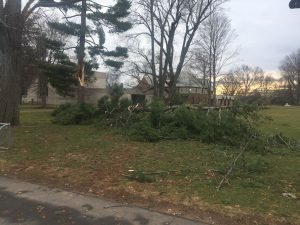 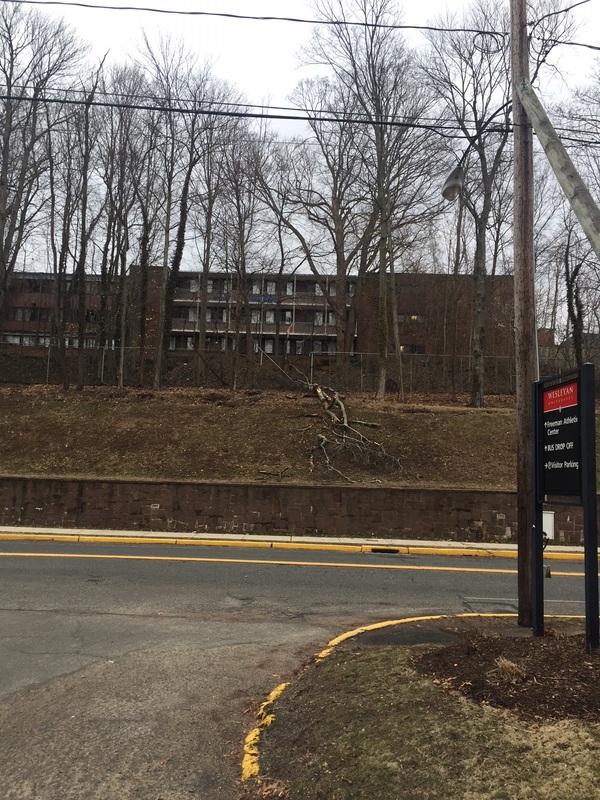 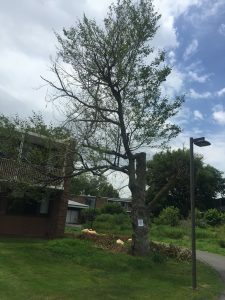 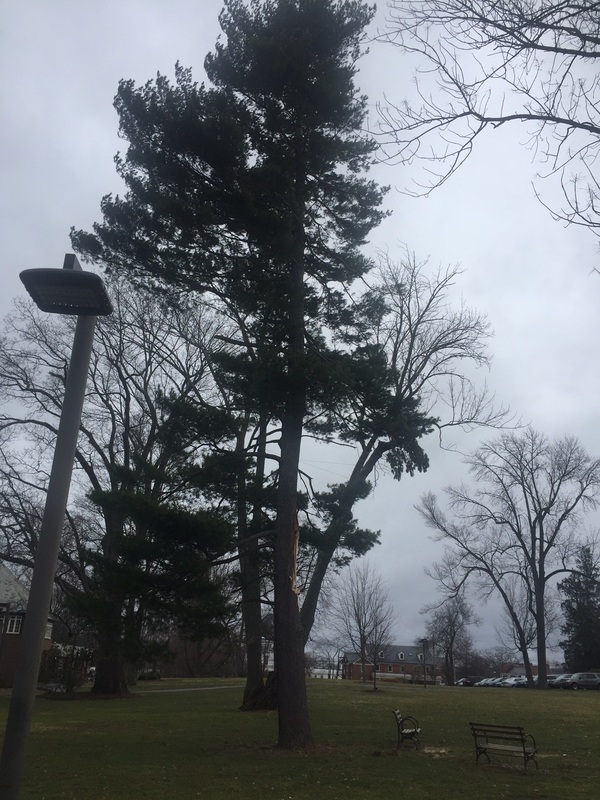 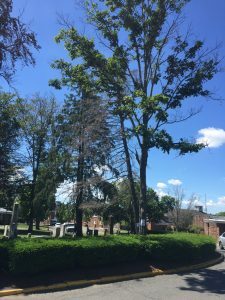 During a recent storm there was significant tree damage around campus. 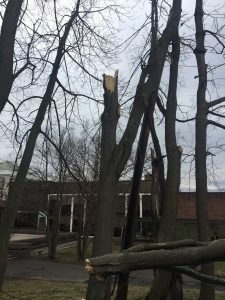 Below are a few trees that were impacted during the storm. 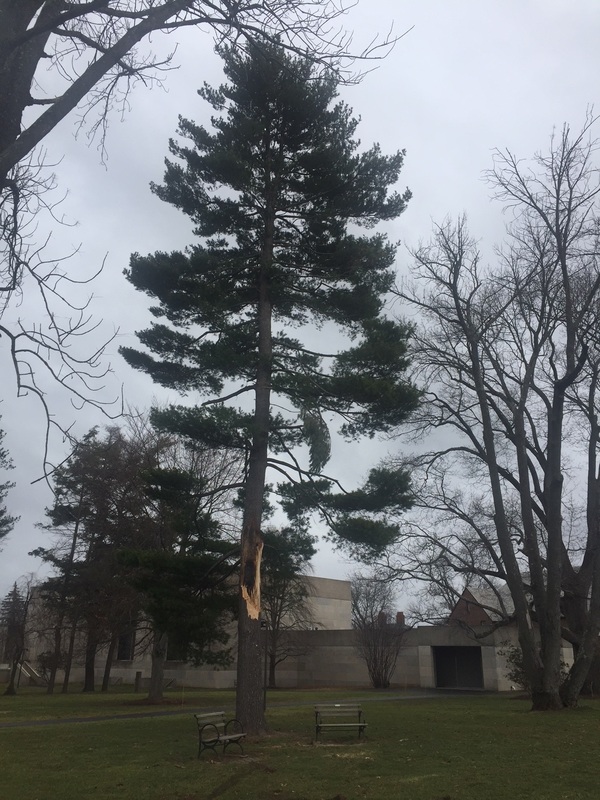 You can see from the photo that tree is leaning dramatically. 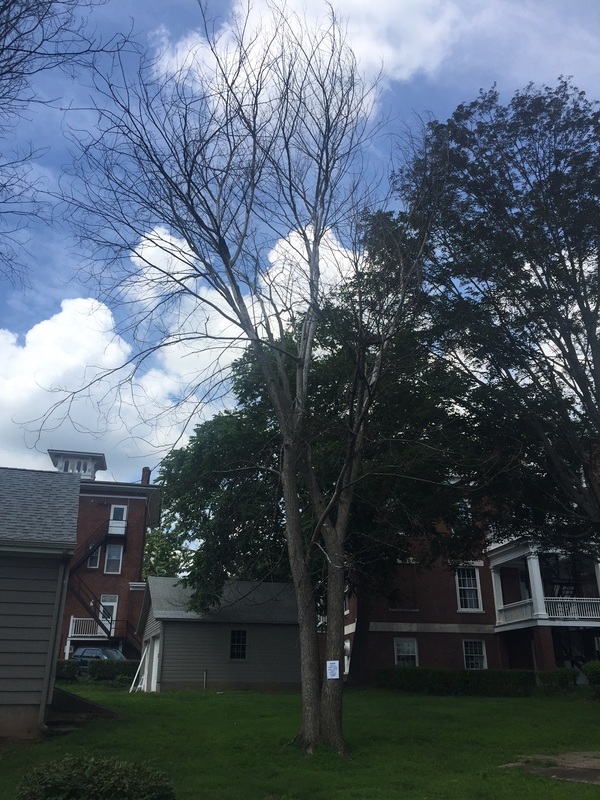 The root system on the tree was compromised, and is not safe to leave standing. One of the two main leaders on this tree fell during the storm. 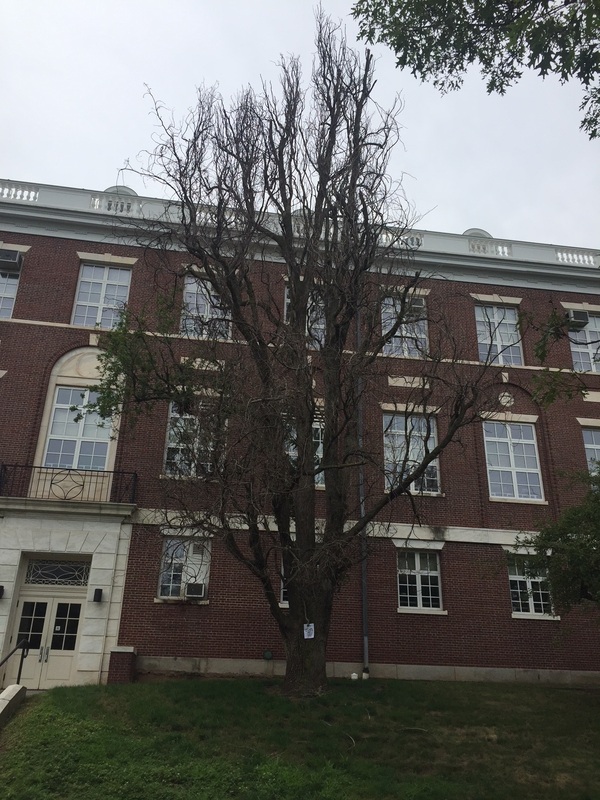 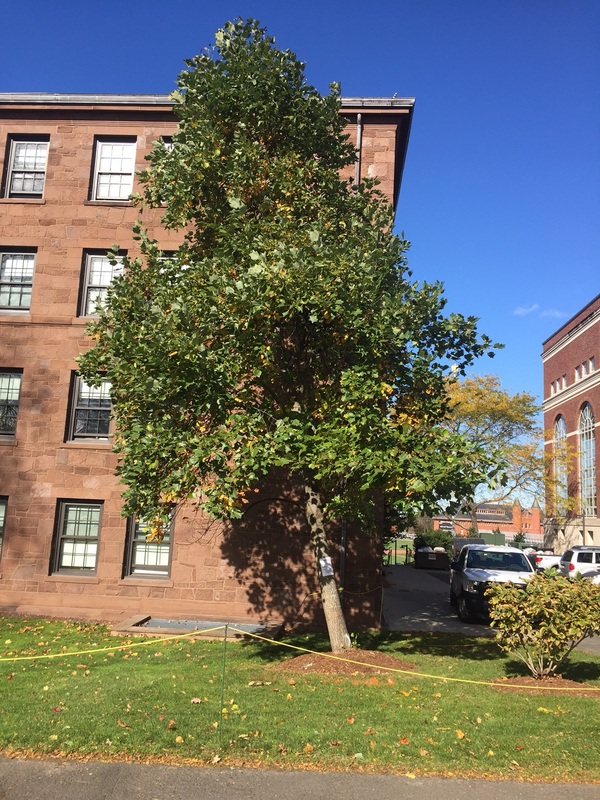 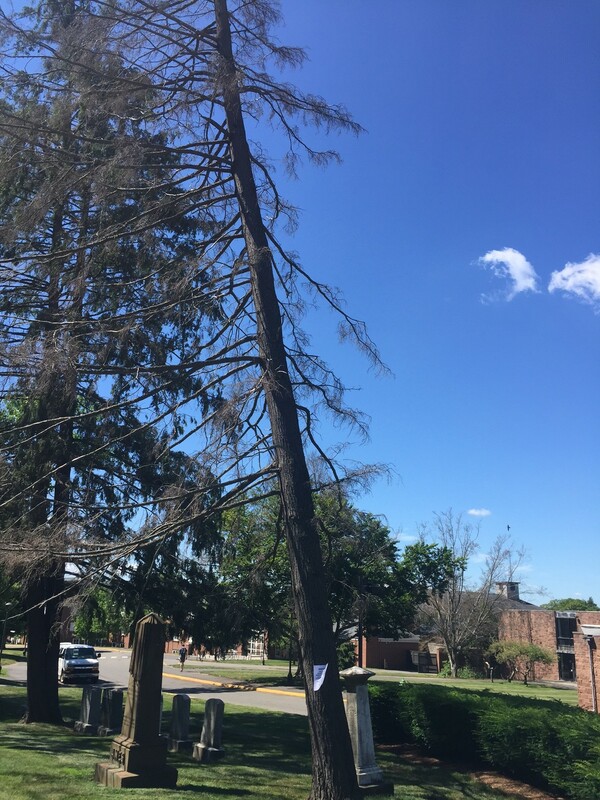 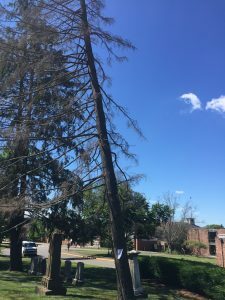 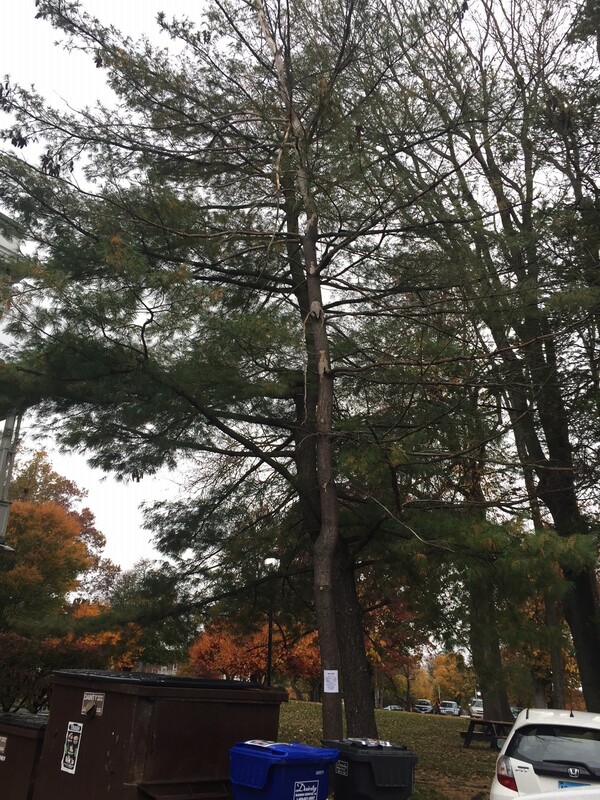 The remaining tree is unbalanced and will be removed for safety. 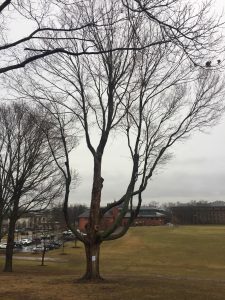 This tree has been in decline for some time, and lost another leader in the storm. 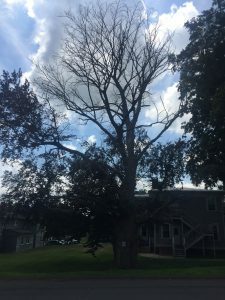 All signs indicate the tree has deteriorated beyond saving. 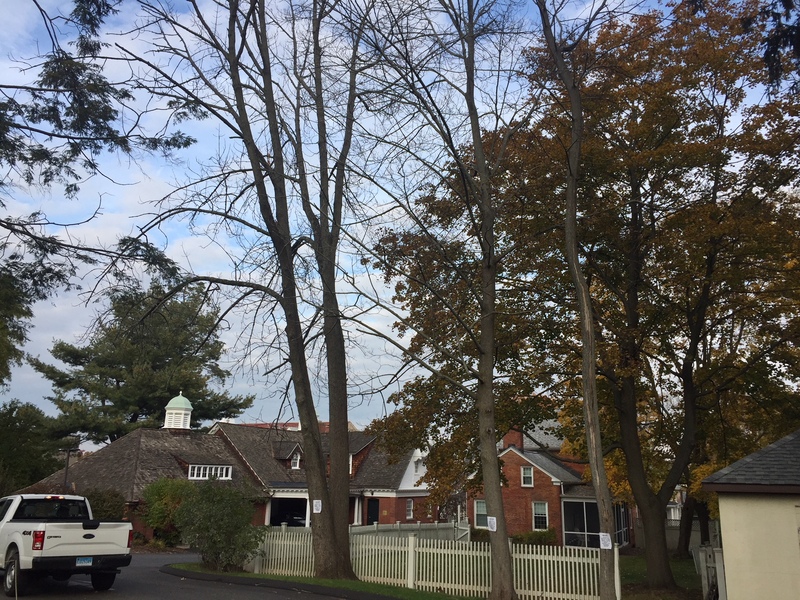 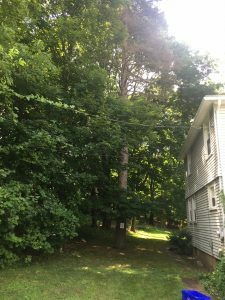 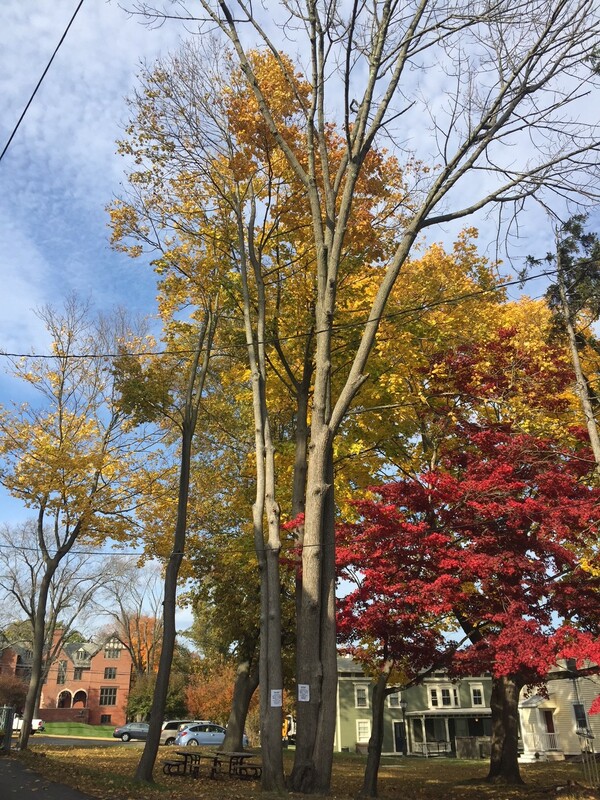 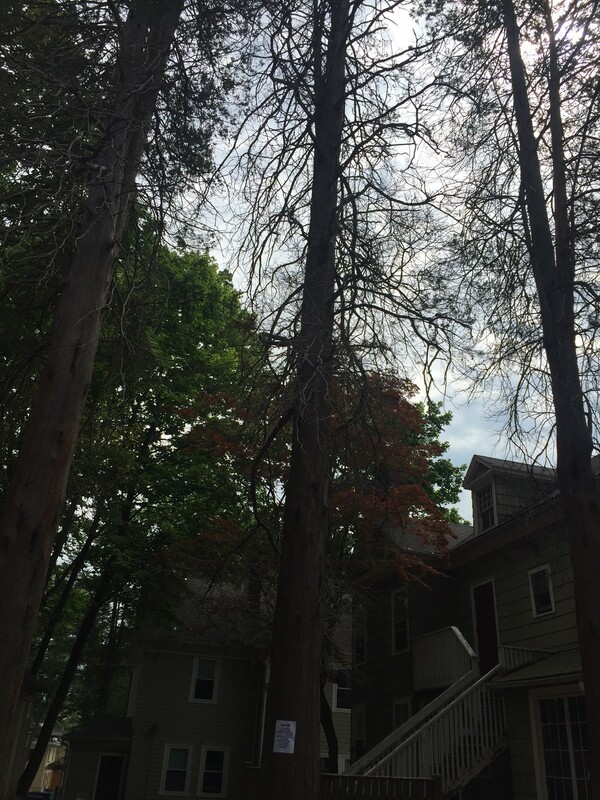 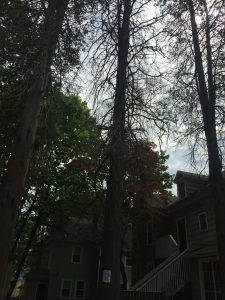 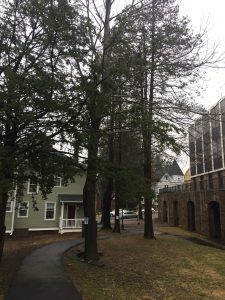 These trees are in serious decline, and stand between two residences. After noticing a few limbs that fell in the storm, we investigated further and found that they need to be removed entirely. 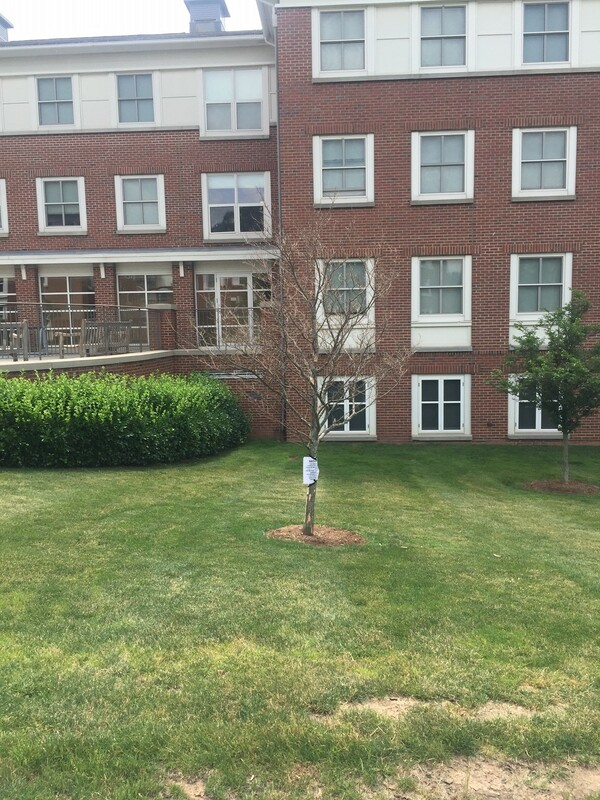 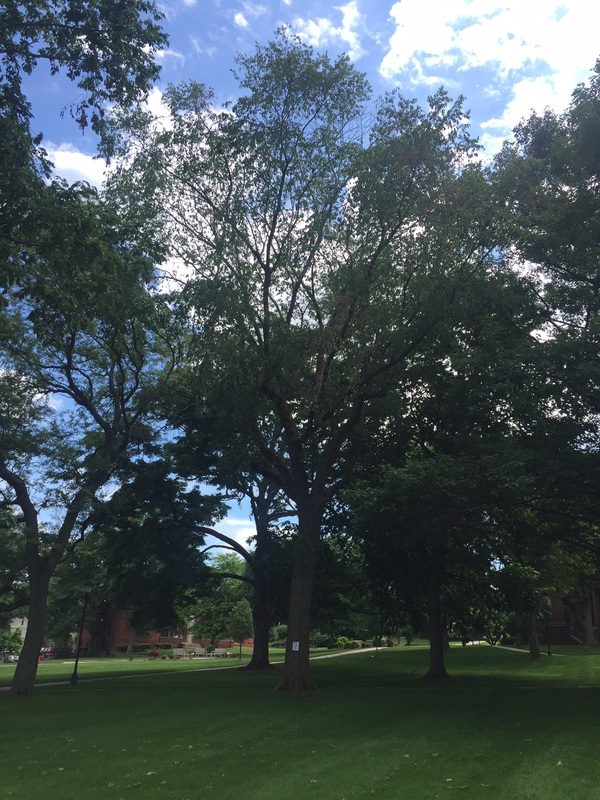 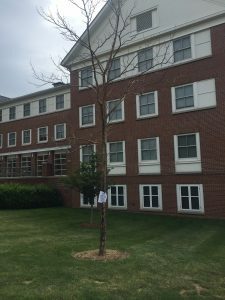 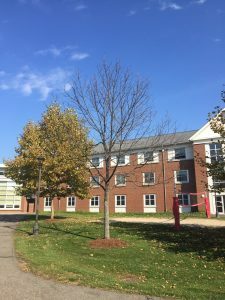 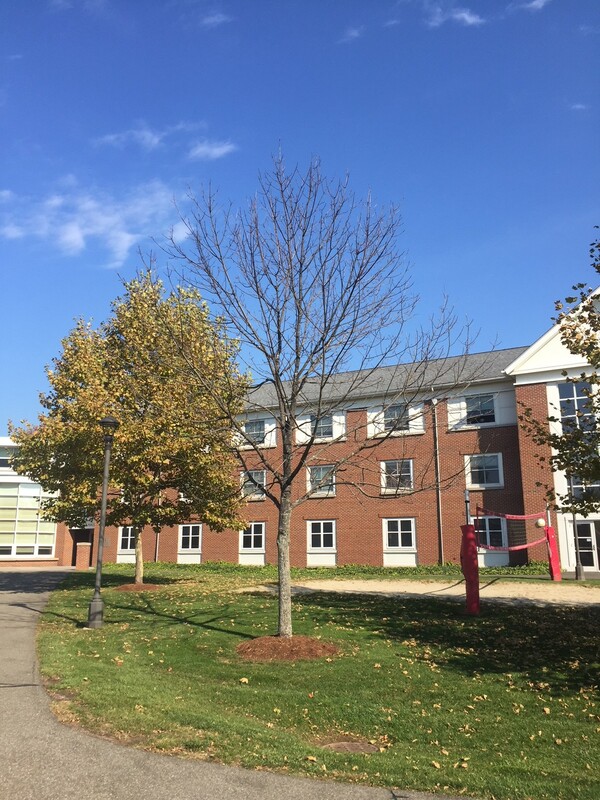 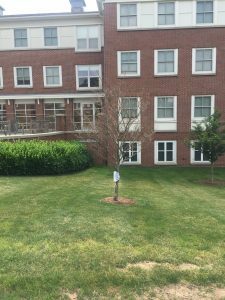 We are starting to see the impact that 2 years of drought has had on our campus tree canopy. 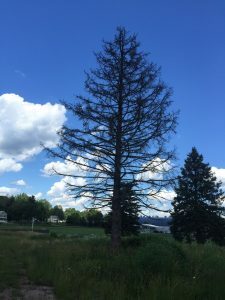 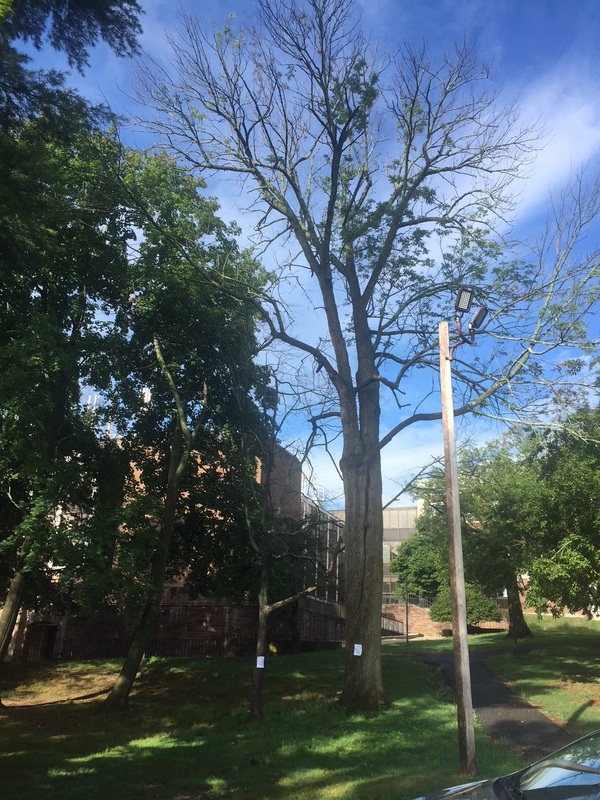 Pictured below are photos of the trees to be included in our first round of removal this summer. Many of these trees are completely dead, others have shown steady decline, and have become hazardous to the community. 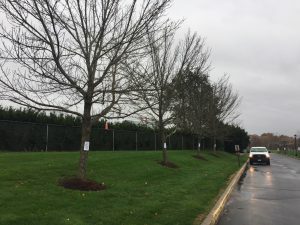 In preparation we planted over 40 trees this Spring, more to come in the Fall.